If you've tried your hand at landscape photography, you have likely come to realize that it can be very challenging to capture strong, original images. 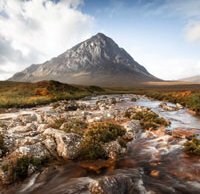 Photographer Adam Karnacz knows that landscape photography is difficult and hopes to help you overcome some of the biggest landscape photo challenges with his latest video. Let's start with one of the foundations of a good image, composition. Particularly if you are photographing well-known vistas, it is hard to find a composition that is not only original, but works well. Of course, there's nothing wrong with shooting scenes that have been shot before, but if you want to make your landscape images stand out, one thing you can do is go out in all weather conditions. A lot of people avoid getting up very early or going out in harsh weather, so if you're willing to do that, you can capture distinct images. Another way to find interesting compositions is to buck the trend with respect to focal length. Landscapes are most commonly shot using wide-angle lenses as people want to get as much of a scene into the frame as possible. However, by opting for a longer lens, you can find a scene within the scene and capture an image which is personal and unique to you. To learn more about how to overcome some of the biggest challenges in landscape photography, watch the full video below. To see more from Adam Karnacz, follow him on Instagram and check out his YouTube channel.